Parasailing, what a wonderful way to end my year! 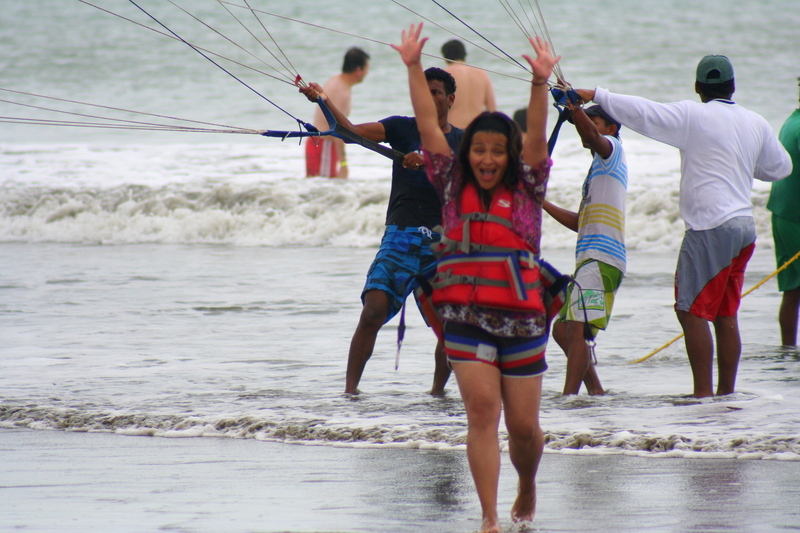 I was having such a sweet time with God, my family and then I got to do this: Soaring above sparkling turquoise waters over the beach in Ecuador was not only breathtaking but to fly over it feeling my hair dance in the wind and smelling the fresh tropical breeze was, exhilarating. Yes, this is my new prayer “God, please, pretty please I want wings.” I don’t think I can look at a bird again without feeling envious. Our Ezine has been in existence for a little over a month now and the Lord has blessed me and from reading your emails and comments(thank you for sending those sweet notes) it has blessed you, your home and even your stomach! I totally concur with our good man William Blake, I definitely can’t soar with my own wings. Prior to my flying experience, I was running on the beach praying down my list of request for this magazine and to be honest and real, though it was a sweet time, at the end I still felt overwhelmed with all that there is to do. A couple of hours later, God was so awesome to give me this experience (I only paid $15 for it!) to remind me that, He is with me and that He is in control. All it took from me to fly was to jump start with a run, I was up in the air without having to lift a single finger up to keep myself there. In the same way, God was reminding me to just do my part and leave the rest in His hands. I was flying in the air as a result of a lot of things working in unison, my science teacher husband could explain to you the scientific facts on how it all worked. What I do know was God was telling me: I am with you working in ways you can’t even imagine or explain in your life and in this Ezine. Al ong time ago, I read these life changing words in one of Jim Elliot’s books “trust in Him and in His name go” they have been forever etched in my heart. My cup runs over with family, friends and you wonderful readers! All precious blessings from above. Thank you! Happy New Years from our home to yours!